Bug Beat: Corn insects aren't going anywhere anytime soon. Perhaps you will identify with the farmer who asked this month’s question. He’s ready to forget worrying about certain insects. Is that possible? Providing information is this month’s panel of Indiana Certified Crop Advisers: Betsy Bower, an agronomist with Ceres Solutions based in Terre Haute, Jeff Nagel with Ceres Solutions in Lafayette, and Darrell Shemwell, manager of the Poseyville branch of the Posey County Co-op. Question: We only raise corn with Bt traits, for both aboveground and belowground pests. Which of these five insects can I quit worrying about? My list includes corn borer, corn rootworm, black cutworm, armyworm and western bean cutworm. PROTECT AGAINST REAL THING: Dow AgroSciences drew attention to a new trait, PowerCore, with these giant fake insects. What matters, though, is if you can control the real ones. Bower: Corn borer is the pest I am currently most concerned about. We typically get two generations per year. This year we did find some egg masses, larvae and evidence they had infested a non-GMO cornfield. Rescue treatments for corn borer are not as effective as using Bt corn. Nagel: Corn borer has a wide host range and has not gone away. We have observed significant corn borer damage in nontraited fields over the past few years. The first-generation damage can be reasonably managed by scouting and applying an insecticide. It is very difficult to apply an insecticide in a timely manner on the second generation. That generation can cause damage to ear shanks and ears. Shemwell: I don’t think you can quit worrying about any of the insects. When we quit worrying is when we will see more resistance issues. Nagel: The past few years we have seen abnormally low levels of corn rootworm damage and adult beetles in areas with historically high levels. Since rescue treatments are not feasible for corn rootworm larvae feeding, using either a Bt trait or soil-applied insecticide still should be considered in higher-risk areas. Continuous cornfields should also be managed for corn rootworm larvae. Bower: In some areas like southern Indiana, corn rootworm has never been an issue. The same applies for western bean cutworm. But in northwestern Indiana, these pests have been an issue and still can be. Nagel: Black cutworm moths arrive on southerly wind currents in the spring. Moths are attracted to weedy fields and cover crop fields. Fields where weeds or cover crops are terminated within two to three weeks of planting are most at risk. 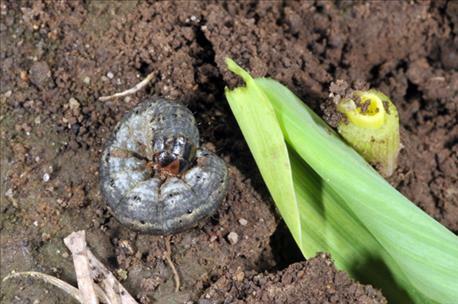 Nagel: The same comments about black cutworm apply here. Armyworm moths also come up on southern wind currents. Problems are more likely in fields that had a green cover when moths arrived. Bower: Armyworms are an occasional pest. It’s best to keep an eye out in the spring for armyworm feeding. We did have several cases in 2016. Typically, issues occur in no-till corn following a grassy weed infestation. Yet you’re certainly not going to see them every year. Nagel: The threat from western bean cutworm is more likely in the northern tier of the state. After a few relatively quiet years, WBC caused some damage in 2016. The Cry1F protein marketed to offer some protection against this pest did not appear to be very effective this year. Going forward, farmers should not assume this trait will protect against WBC. This pest can be managed by scouting fields and looking for egg masses that reach an economic threshold. Insecticide applications are effective if timed properly. Two developments could affect western bean cutworm control in corn in Midwest states. First, Dow AgroSciences will launch hybrids with PowerCore Bt protection against a number of pests for 2017. The trait is new to the U.S., but has been effective in South America for several years. One of the pests it controls, using a different protein than has been used in the U.S. before, is WBC. Second, a group of university Extension entomologists recently issued a statement concerning WBC and the Cry1F Bt protein that controlled the pest in the past. Entomologists from five states in the Great Lakes region, including Christian Krupke, Purdue University, signed an open letter urging companies to make a change in how they approach this trait for this insect. The entire letter was carried in the Oct. 10 edition of the Purdue University Pest & Crop Newsletter. The statement specifically addressed the Cry1F protein, also known as Herculex 1.